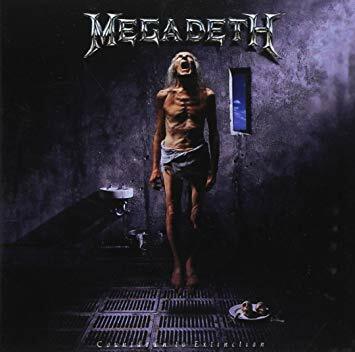 Megadeth released their fifth studio album, “Countdown to Extinction,” on July 14, 1992. It became their most commercially successful album. It features some of Megadeth’s most successful songs, including “Symphony of Destruction” which is regarded by fans as the band’s signature song. The album opens up with the song, “Skin O’ My Teeth,” which is the perfect opening song for a Megadeth album. It has a catchy guitar riff and features plenty of singing from the band’s frontman, Dave Mustaine. It really gives new listeners an idea of what Megadeth is all about. The next song on the album is “Symphony of Destruction,” which is widely regarded as the band’s most popular song. It starts off with an eerie opera piece, then transitions into the main guitar riff. Its pace is consistent throughout the song and it also features a great guitar solo by (former) lead guitarist, Marty Friedman. Its simplicity is probably what made it so successful. The next song is “Architecture of Aggression.” This song is one of those “forgotten hits” and, to me, for good reason. I felt like the song just kind of dragged on. The song has its moments, but it’s one of those ones where you could live both with and without it. Up next is “Sweating Bullets.” This song is one of my personal favorites. It has a slower pace than the four songs before it, but it goes along with the lyrics perfectly. The guitar solo is probably my favorite part of the song. The chemistry between instruments and vocals is what really makes this song pop. “This was my life” is the next song on the album. It’s one of those songs you have to listen to a couple times in order to like it, but it shouldn’t take too long. It’s riff is catchy, and the vocals give the song a little extra spice. Up next is the album’s title track, “Countdown to Extinction.” The song is catchy and Mustaine’s vocals are a little more mellow in this one. The guitar solo in this song rocks and really makes the song come full circle. It even won the Humane Society’s Genesis Award for raising awareness for animal rights. Next is “High Speed Dirt.” The song’s guitar riff isn’t as recognizable, but it keeps you hooked to the song for sure. It features a classic Marty Friedman guitar solo, and ends with a splat… literally. Next up is “Psychotron.” Dave Mustaine’s eccentric vocal style is really emphasized in this song. However, the vocals are simple and easy to understand which makes it a good song for new listeners. The next song is “Captive Honour.” The song starts off with a slow and relaxed pace, which really helps give it that somber tone. Then the song transitions into a heavier beat as Dave Mustaine’s vocals act out a court case. The final song is “Ashes in your mouth.” It jumps right into the action with a heavy pace and stays like that the entire time. The drums are the foundation, the rest of the instruments are the support and Mustaine’s vocals are the cherry-on-top. This album is one of the best Megadeth albums out there. It features many of the band’s best hits. You can find this album online, spotify or apple music and Barnes and Noble.